Now that the ‘A’ level results are out and many prospective students know which university they will be heading to in just over a month, I thought I would return to Dr John Bulaitis’ lecture that will take place at the beginning of the new term at Canterbury Christ Church. As those who follow the blog may recall this is a joint event organised by this Research Centre and the Agricultural Museum Brook, and is the Fourth Nightingale Memorial Lecture. Previous speakers included Professor Christopher Dyer, an eminent medieval social historian from the University of Leicester, and it great that this time it will be one of the History lecturers at Christ Church. Dr Bulaitis will be speaking on his current research topic, ‘the tithe wars’ of the early 1930s and his lecture has the intriguing title ‘The Battle of the Ducks’ and other episodes from the ‘Kentish Tithe Wars’, 1930–36’. As I have noted previously, this was a very difficult time for small farmers, and, as today with the problems for dairy farmers that have been much in the news of late, when costs outweigh returns the situation quickly becomes difficult and ultimately unsustainable, cash flow being the killer in many business failures. However farmers today do not have the added burden of having to pay tithes, but this was not the case a century ago and tithe demands in the early 1930s were what broke the proverbial camel’s back. So if you want to come to Dr Bulaitis’ lecture on Friday 2 October, beginning with a wine reception at 19.00, the lecture commencing at 19.30, you are most welcome. It will take place in the main lecture theatre in Old Sessions House. 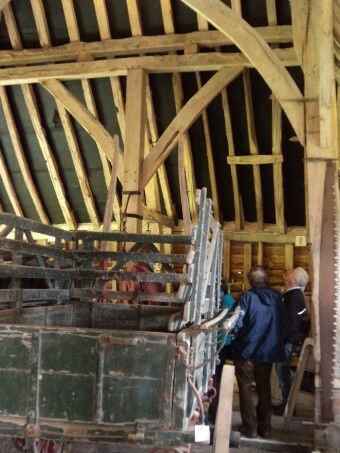 Do come along and bring your friends to this celebration of Kentish history, the new term and what is a fantastic Agricultural Museum at Brook, sited in a magnificent medieval barn and next to a stunning Norman church. Interestingly the history of tithe disputes in the county is a long one, as Dr Paula Simpson has discovered. Initially she conducted her research on the sixteenth century, not least because the Dissolution of the Monasteries brought a considerable change to the identities of those who held the tithes. The idea behind tithes was to provide a living for the incumbent and to recompense the holder of the advowson for providing the said incumbent, sometimes this was the same person/institution, and to help the parish poor. Across Kent during the Middle Ages a very high proportion of those holding these parish advowsons were churchmen: the archbishop, the bishop of Rochester and the many religious houses, although concentrated primarily in the great, ancient houses at Canterbury, Rochester and Dover. Hence Dr Simpson’s interest because once these monasteries were gone, the advowsons came into lay hands and she wanted to discover what impact this had on the tithe payers, as well as to see how these new tithe farmers operated. Her doctoral thesis is fascinating, and one of the themes she discusses is the idea of collective memory. She highlights the value placed on the elderly people of the parish, not just the men, and that what they said had been done and said in the past was seen as ‘true’. Consequently they were the custodians of custom, whether it was the way the corn was harvested, the wood was cut or the route taken when the parishioners gathered together with the minister and churchwardens to ‘walk the bounds’. Such an inter-play of past and present, and the importance of tradition was, of course, open to manipulation to a degree, but had to be acceptable and accepted by those involved, something that was sometimes problematic in the changing and often difficult times of the late sixteenth century. I thought I would end with one of two cases involving the people of Brook in the Tudor period which is taken from Dr Simpson’s thesis. It involves a ditch, which may not sound very exciting but when people dig up the road to create a ditch, it does. The ditch-digger in question was Philip Dence and the case came before the court in 1598. The jury heard that Dence had recently dug a pit across the lane thus disrupting the perambulation route because it was ‘so brod and soe full of water they the said Minister & parishioners could goe no further but returned backe againe’. The main witness was Robert White who had a vested interest in the matter because he had some property title to that part of the lane lying in Brook parish and had sued Dence for trespass before. The court found in favour of White who was awarded costs and damages against Dence. However the problem of the lane as a boundary continued to exercise the minds of those in Wye, as well as Brook, and in 1691 the Wye churchwardens ordered that a perambulation of the bounds of Wye should be compiled from a copy dated 1674. It has the intriguing section that those walking the bounds should ‘cross the field to a marked stump in the corner of the hedge leading to a pond at the entrance to a lane called Greenfield lane so on the west of the ash on the ditch-side to a gate (the east corner of the field is in controversie between Brook and Wye and therefore not bounded by us)’; quoted by Dr Simpson from N. Morris, The History and Topography of Wye (Canterbury, 1842). Such boundary texts are extremely interesting and can tell us a great deal about contemporary society. As a final point they don’t only exist for parishes but also for town liberties, and, as some of you may remember, several weeks ago the actions of those walking the boundaries featured in the dispute at St Lawrence’s hospital in 1436.